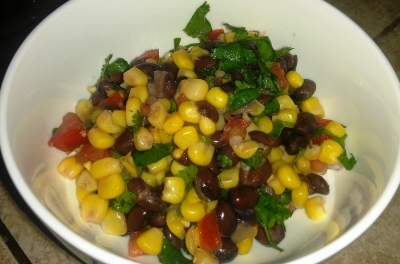 South of the border flavor on this corn side salad. You can top your chicken, meat or other protein with this delicious salsa. Just the right amount of heat. Drain 1 16 oz can of no salt added black beans and rinse. Also drain and rinse 1 16 oz can of yellow sweet corn. Dice tomato, onion, and serrano pepper. Toss tomatoes, onions, serrano peppers, beans, and corn together. Juice one lime and pour onto bowl with the ingredients. Chop some cilantro, add salt and toss.